One tool that is offered in most beginning beekeepers kits by bee supply dealers is the bee brush. After 48 years of working with the bees, I have several bee brushes, but they are primarily stored with some of the other bee equipment that I do not use regularly. What is the purpose of a bee brush, anyway? Most people will say it is to brush the bees off of the comb. Okay, when is that? 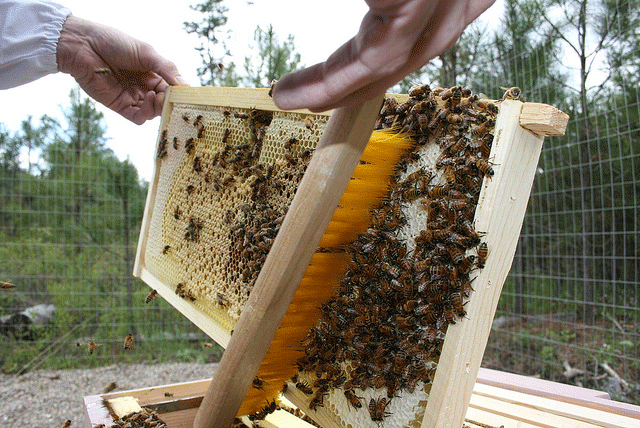 During harvesting, queen rearing, and sometimes in making splits. During harvesting, you would brush the bees off each frame before you put it into a box for safe transport to the honey house. It is a very time consuming job, where you might be further ahead removing a super at a time or using other methods such as shaking bees off the frames or blowing the bees off the frames. I could use chemicals, but I want to be able to go into my house without having to change clothes in the garage or outdoors. I have seen some queen rearing people brush bees off of the frame that they are going to graft from, but I have also seen some queen producers shake the bees off the frames. I guess that it takes a lot of practice to know just how much shaking the eggs and young larva can take before they get damaged. You can also blow on the bees and usually they take off. Have you ever tried to brush bees? The long soft bristles create a lovely haven for the bees to get trapped in and it does wonders to their disposition when you sweep the brush across the comb, rolling the bees. Just as soon as they can get free, they’re coming after you. So maybe the soft bristles that are offered in bee brushes aren’t such a good idea, but the companies make the pig bristles and horse bristles sound so good. Oh you can have several choices: one row of bristles up to three rows of bristles. Just think how many bees you could trap with three rows of bristles. Come to think of it, I do have a three row brush. However I call it a shop brush and it is good for sweeping up all kinds of dust and small particles. [ngg_images source=”galleries” container_ids=”11″ display_type=”photocrati-nextgen_basic_thumbnails” override_thumbnail_settings=”0″ thumbnail_width=”120″ thumbnail_height=”90″ thumbnail_crop=”1″ images_per_page=”9″ number_of_columns=”0″ ajax_pagination=”0″ show_all_in_lightbox=”0″ use_imagebrowser_effect=”0″ show_slideshow_link=”1″ slideshow_link_text=”[Bee Brush slideshow]” ngg_triggers_display=”never” order_by=”sortorder” order_direction=”ASC” returns=”included” maximum_entity_count=”500″]As far as I can tell the bee brush was started by bee keepers using handfuls of grass or round brushes similar to brushes that are currently used to do stippling. Both of these have draw backs as your hands are very close to the bees and you might be better off waving your hands and using smoke. However in 1888 the Root Company sold two bee brushes, the Yucca Bee Brush and the Davis Improved Wire Handle Bee Brush. The handle on the Davis brush was galvanized metal. In 1893 the Coggshall’s Bee Brush was added to the Root line. It was a modified whisk broom with some of the bristles trimmed. It mentioned a flicking motion rather than a sweeping action. In 1905, the Root Company added the Dixie Bee Brush to the line which had bristles on both sides of a wood shaft and handle put together with brass screws. The bristles were long enough that they would cover a Langstroth frame and in”two sweeps, you ought to clear the bees.” The only other bee brush offered for sale in 1905 was the Coggshall brush. In 1908, a new German Bee Brush was added to the Root line. The German Bee Brush is similar to the bee brushes of today and was available in black or white horse hair. There was a report that one beekeeper used a German Bee Brush for one season and harvested 20 tons of honey. That boggles my mind as that is a lot of sweeping or flicking of a brush. It is said that at the end of the season the brush was washed and didn’t show any signs of wear. It also mentioned that the white bristles were less irritating to the bees. In 1925 the German Bee Brush was offered for sale and the Coggshall brush was replaced by a Bee Whisk Broom. It only took 32 years to figure out that a whisk broom with thinned strands could still be a whisk broom. It takes a little effort to find an old fashioned corn whisk broom. Most of the whisk brooms that you see today are plastic brushes and I even encountered a sales clerk in the broom department that didn’t know what a whisk broom was. She wanted to sell me a broom with a 30 inch handle. In 1939, the Bristle Brush appeared on the scene. Guess what? It looks very, very similar to the German Bee Brush. The bristles are similar to some of the brushes today in that they are made of a man made material. The handful of grass has some advantages. You never have to carry it with you and when you are finished with it, it can be thrown away. If it becomes broken or dirty, you can get another handful. I tied the bunch together for the sake of taking a picture. The only precaution that I can think of is to not use plants like poison ivy. My mentor showed me two ways to shake a frame. The first way is to grasp the frame at the center of the top bar and hold it as tight as you can and then with your other hand give the gripping hand a quick rap. If it is done correctly, all the bees will fall off the frame. The other way is to hold the frame with both hands on the ears of the frame and shake it with a sudden jerk. It may take two times until all the bees are off the frame. With practice, you will find that it is faster than brushing bees. 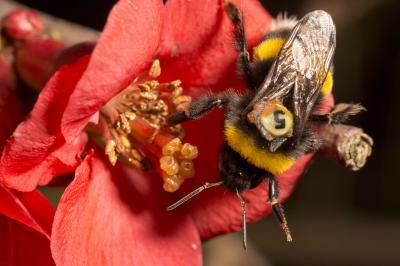 However a bee brush does come in handy when a swarm settles on a fence post, the side of a house, or the trunk of a tree. Some things are just too big to pick up and shake. If you use a bee brush, you should make sure that you wash it occasionally to keep it free of the products of the hive. A dirty brush with honey in it is an attractant for bees and you may rile up the bees before you get a chance to use the brush. The synthetic bristles wash up and dry faster than the horse hair or pig bristles. What is the difference if you sweep or flick the brush towards you or away from you? About two milliseconds! Yet there might be another solution to moving bees. Rather than sweep, brush, or shake them why not herd them. A credit card or piece of cardboard could be used to move the bees around. I have even heard of people using large feathers. Jim Thompson is a long-time beekeeper and beekeeping historian living in Smithville, Ohio. He’s also a frequent contributor to Bee Culture.